Shown during its flight test program, V Australia's new 777-300ER is outfitted for 361 passengers -- 33 in business class, 40 in premium economy and 288 in economy class. 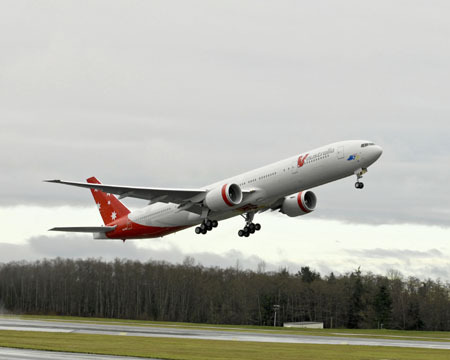 SEATTLE, Feb. 6 /PRNewswire-FirstCall/ -- Boeing and the Virgin Group's new V Australia long-haul airline today celebrated the first 777-300ER to go to an Australian carrier. The airplane, delivered by Boeing to International Lease Finance Corp. and leased to V Australia, is one of seven leased and purchased 777-300ERs V Australia will deploy on trans-Pacific and other routes. The Boeing Field ceremony included Virgin Group Founder Sir Richard Branson, Virgin Group Chief Executive Brett Godfrey, ILFC Chairman and CEO Steven F. Udvar-Hazy and senior Boeing officials. V Australia will launch three-class Sydney-Los Angeles non-stop service on Feb. 27, building to daily flights by March 20. Brisbane-Los Angeles flights begin April 8. "This 777 completes the circle for guests wanting to fly around the world on the unique service provided by Virgin Group airlines," Godfrey said. "The combination of Virgin service and the 777's passenger appeal will be a winner on the South Pacific. "We're doubly pleased to be flying the most fuel-efficient aircraft in its class." V Australia's 777-300ER carries 361 passengers in business, premium economy and economy classes, with advanced in-flight entertainment options. Boeing has been eager to see an Australian airline using the 777's capabilities in the South Pacific region, according to Stan Deal, Boeing Commercial Airplanes vice president, Asia Pacific Sales. "It is a great day to see this 777-300ER take on the job it was designed for," he said. "V Australia will be first with 777 service on the Sydney-Los Angeles route -- exactly why we built this airplane. We congratulate V Australia for its visionary role." John Wojick, Boeing Commercial Airplanes vice president, Leasing Sales, added, "ILFC is the world's largest 777 customer and, through its leadership and vision, has partnered with Boeing to expand the worldwide market for the 777, including this first 777 in Australia." The 777 family is the market leader in the 300-to-400-seat segment. Since the 777 entered service in 1995, Boeing has grown the 777 family to include five passenger models and a freighter. V Australia's 777-300ER is powered by the GE90-115B. Certified at 115,000 pounds (512 kilonewtons) of thrust, it is recognized as the world's most powerful commercial jet engine, while demonstrating superior efficiency and environmental responsibility. To date, 56 customers around the world have ordered nearly 1,100 777s, making it the market's most successful twin-engine twin-aisle airplane. Boeing has 350 unfilled orders for the 777.